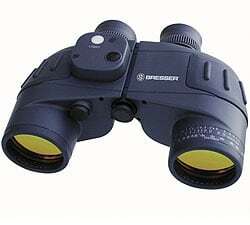 Founded in 1957 by a Mr. Josef Bresser, Bresser began life as a company that specialized in the importation and distribution of binoculars. The technical development and design of new and innovative optical products began later in 1979, when Rolf Bresser (Josef's son), took over the business. Operating out of their headquarters in Germany, but with distribution centers all over Europe and in the USA, Bresser Optics design, build, and sell telescopes, spotting scopes, microscopes, and niche electronics and are one of the leading suppliers of optical instruments all over Europe and the rest of the world. The Bresser business was sold in 1999 to the American market leader Meade Instruments Corp located in Irvine California. Meade is a publicly traded company on the NASDAQ stock exchange and a leader in their market of state of the art diffraction-limited astronomical telescopes. Then from 2009, Bresser returned to becoming an owner operated company with Rolf Bresser, the son of the founder still being one of the main shareholders of Bresser GmbH. 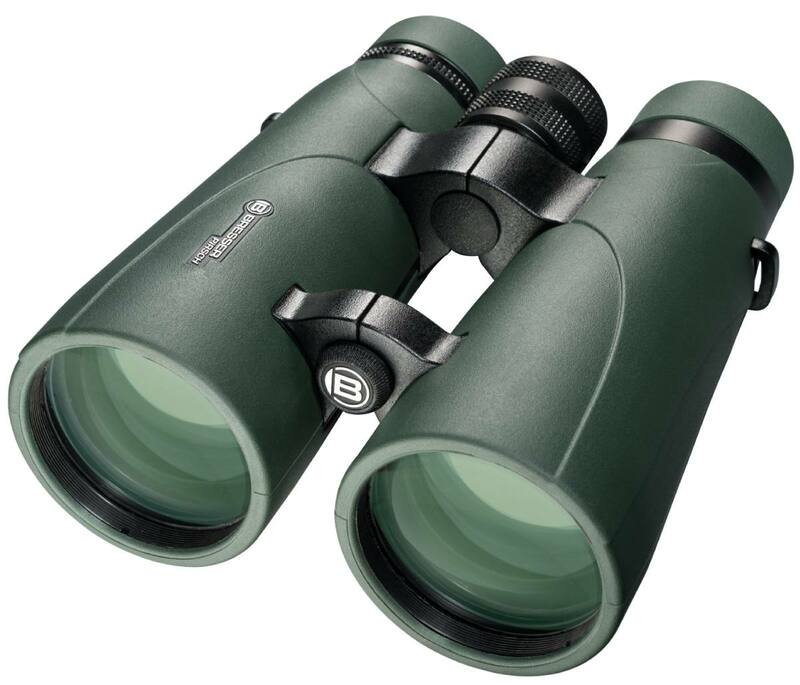 The Bresser range has been continuously expanded they now have a portfolio of more than 70 binoculars and spotting scopes suitable for astronomy, bird watching, hiking and rambling as well as hunting, sporting events, and marine use. Bresser's most recent range of high-level instruments is the Montana series. It is an interesting collection in that it contains only four roof prism models in two different size cateories. The two large 45mm options are available in either 10.5x or 8.5x magnifications and then two compact 25mm Montana binoculars in either 10x or 8x powers. The 45mm versions have ED glass within their lenses and a magnesium chassis, whiclt the compacts use aluminium for the chassis and do not have ED glass within the objectives. All models are have full broadband multi-coating optics and use BaK-4 glass for the roof prisms which are also phase corrected. The quality also extends to the accessories as all models come supplied with a real leather bag as standard. I also like the double hinge design on the compact 25mm Bresser Montana binoculars which enables the instrument to fold up into an ulta space-saving shape making them a true pocket binocular and thus are much easier to carry to sporting events, on hiking trips and even to the museum. 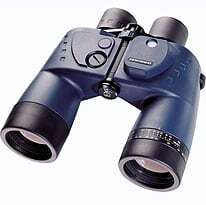 The Luchs are Bresser's top of the range binoculars that are also known as Bresser Lux Binoculars in some markets. They are available in 8x42 and 10x42 models. Quality components are used throughout with fully multi-coated optical elements and BaK-4 prisms that give a sharp and high-contrast image over the full field of view. The binoculars are 100% waterproof and Fogproof - filled with nitrogen to ensure there is no internal fogging in extreme climatic conditions. The large focus wheel ensures quick and accurate focussing and the high eye relief eyepieces, combined with twist up rubber eyecups make sure you get the full field of view with the Lux binocular even if you wear glasses. A point to mention is the minimum focus distance of only 3.9 ft (1.2 m) - Ideal for close observation for things such like insects and butterflies in full format. Depending on the model, they range in price from about $250 - $300 (£210 - £250) and as such these "Mid Priced Binoculars" are competing with with the likes of the very good Minox 10 or 8x42 BV's (view and compare all Mid Priced Binoculars that I have reviewed). The Pirsch range is one of Bresser's mid-level series and is aimed at delivering a high performance binocular for the more serious enthusiast, but at a price that is relatively affordable. Or to put it another way, the aim of this series is to offer plenty of bang for your buck! All models within the series use roof prisms and have a weight-saving open bridge body design. As you would expect at this level, Bresser Pirsch binoculars are fully waterproof and nitrogen purged to protect the inner glass surfaces from fogging. Also as expected, these have twist-up eyecups and a right eye-diopter adjuster. The focus wheel is centrally located in the standard position. Made using BaK-4 glass, the Schmidt-Pechan roof prisms are phase-corrected and whilst they say they contain the "Ultimate Reflection Coating", Bresser does not explain what this means - my guess is that they are dielectrically or at worst silver coated (If I get confirmation on this, I will update this info). 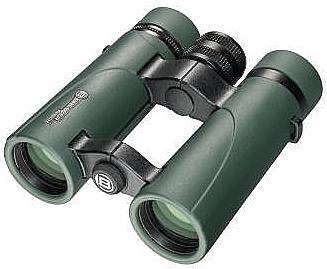 There are 6 models of roof prisim binoculars in the Bresser Condor range that is also sometimes refered to as their Safari range of binoculars. 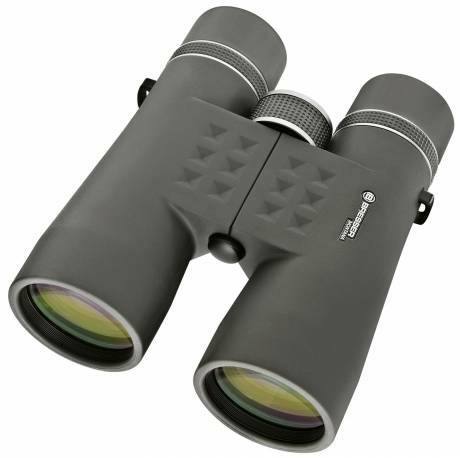 These "take anywhere" binoculars are ideal travelling companions, especially the compact 8x32 and 10x32 Condor's that are ideal as Safari Binoculars or for activities like hiking. Whilst the Bresser Condor 8x42, 8x56 as well as the 10x42 models have a larger light-gathering power, that is especially useful in dusk or dawn conditions giving you brighter images. The 10x50 model is ideal for those who want a bright and high magnified image in more difficult light conditions. They also come with quality BaK-4 prisms and are fully multi-coated and the body of the Condor is made of the latest engineering polymer, a product of the space research industry, for lightness and strength. All models have an "objective lens cap system" that allows quick opening and closing, but can also easily be removed. The Bresser Cobra range is diverse with two porro and two roof prism designs of binocular and are thus suitable for many applications. These binoculars are on the cheap end of the scale and as such use BK-7 glass in their prisms and multi-coated lenses (as opposed to BaK-4 prisms and fully multi-coated lenses in the more expensive models) to all the optical surfaces which Bresser say "guarantees an additional enhancement and features a high contrast and brilliant observing quality." The roof prism models have "Twist up" eyecups and long eye relief eyepieces to allow a full field of view for those that wear glasses. Whilst with the porro prism Cobra's that include one of the popular Bresser 10x50 binoculars you get folding rubber eyepieces, 5-lens eyepieces and standard tripod thread making it simple to attach the Cobra binoculars to any photo-tripod. All Nautic series models are waterproof (Immersion tested at 1m for 60sec) and have a water resistant and robust rubber armour as well as a gas purged optical tubes and are supplied with a flotation strap. The gas purged filling of the Nautic binoculars prevents water and moisture from entering the binocular by creating an interior pressure capsule and are therefore the ideal binocular for maritime use on board. The 7x magnification model makes it possible to achieve a relatively steady image during rough sea conditions. The Bresser Nautic 7x50 Binocular (WP/CMP) features a integrated and illuminated precision compass, whilst the Bresser Nautic 8x42 has an integrated digital compass in its armour housing, which points you the right way, at any time. Temperature and time are shown on the display. The TwistUp eyecups ensure an optimal eye distance setting. It’s nitrogen filled body prevents the optics from fogging up on the inside of the binocular, caused by rapid temperature variations. All Bresser Binocom binoculars are filled with nitrogen gas and are therefore 100% water proof as well as fog-proof. They also come equipped with a floating neckstrap, which prevents the binocular from sinking should it accidentally fall into the water. 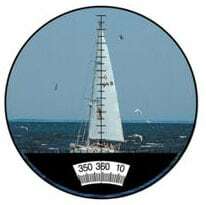 Other marine features include an integrated reticle for measuring distances. Ontop of this the Binocom 7x50 CLS and 7x50 GAL binoculars also have a built-in illuminable 360° pricision compass to help with navigation and the 7x magnification power makes easier to achieve a relatively steady image during rough sea conditions. The Binocom 7x50 DCS has an integrated digital compass and display of the binocular angle. Quality BaK-4 prisms are used and lenses are fully multi-coated which is good. 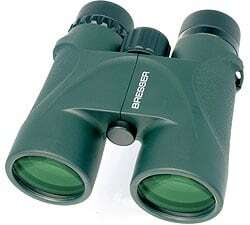 Bresser's cheapest range of binoculars are their Hunter binoculars, which despite their name arn't specifically desinged as a hunting binocular. This family contains a wide range of binoculars, with 7 models (5 porro prism designs and 2 compact roof prisms). To save costs they have used cheaper use BK-7 glass in their prisms and multi-coated lenses as opposed to BaK-4 prisms and fully multi-coated lenses in the more expensive models. The Porro versions have a tripod adapter thread and can be easily connected to a regular photo tripod. 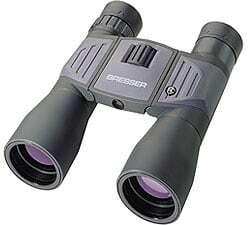 Since 2012, Bresser has been producing binocular under license for National Geographic. These National Geographic Children's binoculars are based on their very successful ExploreOne 6x21 Junior Compact binoculars and are a fully functional roof prism compact binocular that has the optical performance that matches that of a standard 'adult' compact binocular at the same sort of price level. At 360ft wide at 1000yds, the width of view is indeed nice and wide which is great news as I know from my daughter that one of the biggest things that younger kids struggle with is actually finding what they want to look at. The shape is very compact and thus ideal for small hands and they have a large centrally located focus wheel that is easy to reach. 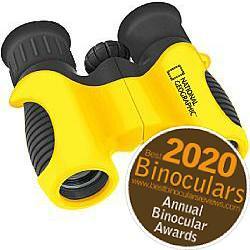 The National Geographic Kid's binocular is also very lightweight, which once again is ideal for youngsters. I also like the tough housing: The main chassis is made from a polycarbonate plastic and the exterior is rubber armored to withstand the inevitable knocks and bumps. These instruments also come with a soft carry pouch, wrist strap and cleaning cloth, just like Mum and Dads! 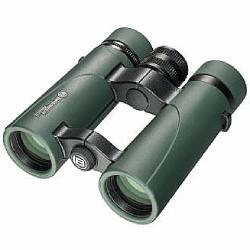 The optical glass that Bresser use in these is coated with an anti-reflective coating for a brighter and better quality image than what you get on the many imitation kids binoculars that don't have any coatings and which are now available. Just like standard binoculars, these have a diopter adjustment ring to calibrate them to cater for any differences in vision between the left and right eyes. 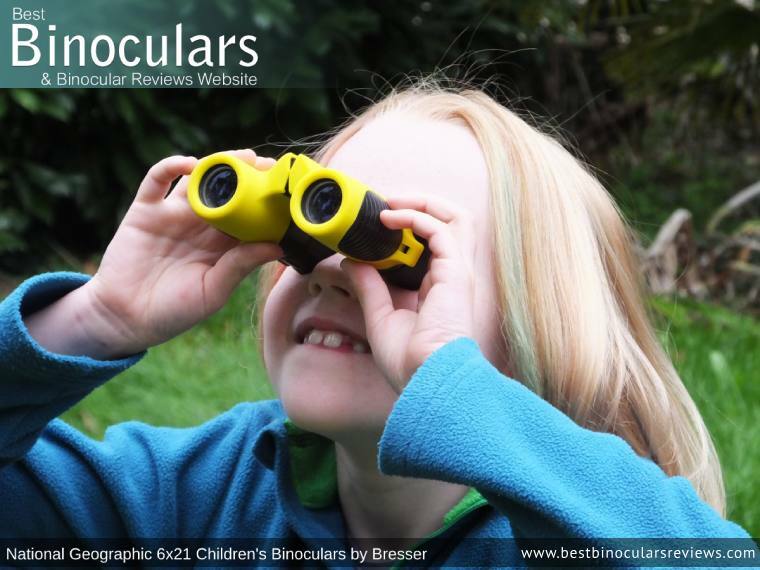 Levenhuk suggest that these are suitable for children of 4 years and above which is about right, however I know from experience that my daughter was capable of using the very similar Bresser ExploreOne 6x21 Junior Compact Binoculars from around 3 years old. Since then we tested and reviewed this exact National Geographic model when she was 7 and whilst she has access to loads of other binoculars this is her favourite. As for a maximum age, a lot depends on their previous exposure to optics, but these should be perfectly fine for kids of about 10 or 11 years old. 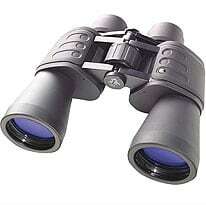 For older or more experienced kids, take a look at some of the standard compact binoculars that I suggest below. One last thing to mention is that these have an IPD range of 5cm to 6.3cm. So, once again perfect for smaller faces with closer set eyes. Read the full Review - Fully tested in colaboration with my daughter, you can read my the full review here! Absolutely perfect for younger kids and good your the parents bank balanace too! Origionally priced at around $30 / £30 / €30, you can currently find them on offer for about $15 in the US, €15 in Germany and Europe and £15 in the UK. 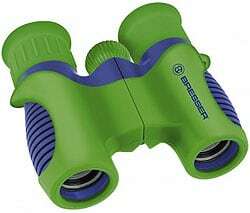 Whilst the Bresser Junior 6x21 is very colourful, it is in no way a toy binocular! 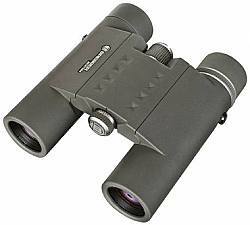 It is a fully functional roof prism compact binocular. 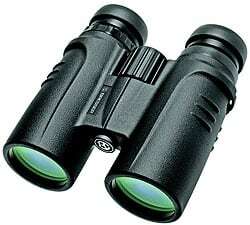 The 6x magnification is ideal for children and they are very light and compact. They have Bk-7 prisms and has a fully coated optical system that delivers crisp, colourful images to the eyepieces. The body of the binocular is rubber armoured to withstand plenty of punishment. Bresser are so confident that these optics can handle what you children can throw at them that they come with a five year guarantee! Also included is a neat carrying case ans small wrist strap.